Landaas & Company newsletter February edition now available. 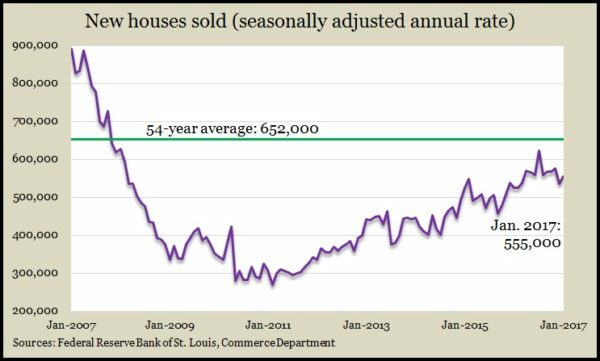 The annual rate of existing home sales rose to nearly 5.7 million in January, the fastest pace since February 2007. The National Association of Realtors said the strong employment market and high consumer confidence are fueling sales, despite higher interest rates. The trade group cited continuing concerns about lack of inventory. The supply of houses for sale has been declining year-to-year for 20 months in a row. Fairly steady demand and shrinking supply pushed the median price up 7.1% from January 2016, the 59th consecutive increase. The moving four-week average for initial unemployment claims fell to its lowest level since July 1973. According to Labor Department data, jobless applications were 33% under the 49-year average, suggesting persistent reluctance by employers to let workers go. As with housing, steady demand for workers should help raise wages, which tends to fuel the consumer spending that drives nearly 70% of U.S. economic activity. Another sign of the long, uneven housing recovery was a lower-than-expected pace of new home sales in January. Commerce Department data show an annual sales rate of 555,000 single-family residences in January, up 3.7% from December and 5.5% ahead of the January 2016 pace but still below the 619,000 rate just before the Great Recession began. In what might be good news for the Realtors, the data suggest the supply of new houses for sale grew to its highest level since the recession. More new houses could have a ripple effect for the existing homes market. Consumer spending should continue on a steady 2.7% pace through 2017, based on the February consumer sentiment index from the University of Michigan. The index dipped to 96.3 from a 10-year high of 98.5 in January. The less volatile, three-month average reading was the highest in nearly 13 years. Consumer assessments of current economic conditions remain relatively high while expectations declined a little. Economists consider consumer sentiment a leading indicator of consumer spending.